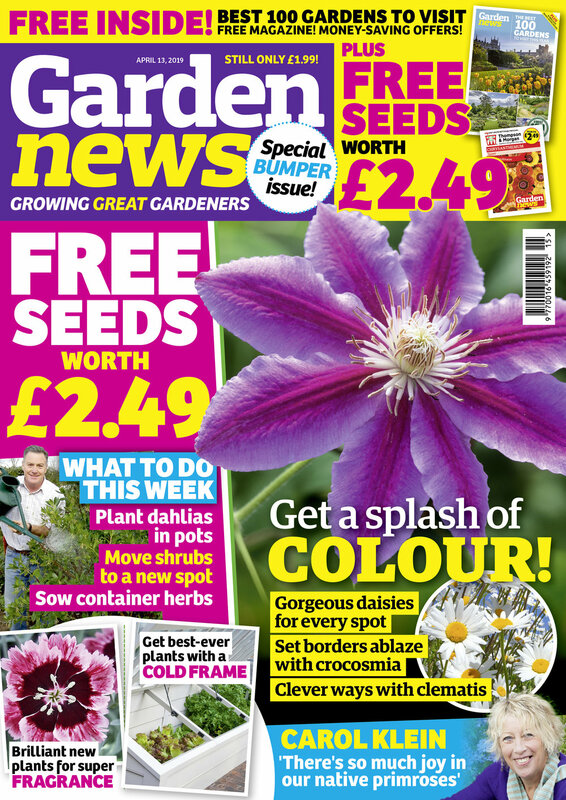 Garden News is on a mission to grow great gardeners every week and we want you to be one of them! As we get into the prime gardening season we want to help you become the best gardener you can, and Garden News is getting even better! More expert advice! Our rosters of brilliant gardening writers includes Carol Klein, Nick Bailey, Rob Smith, Medwyn Williams, Terry Walton, Naomi Slade, Tony Dickerson, Ian Hodgson and Karen Murphy. Every week they will bring readers the very best gardening advice as well as answering questions to make the mag more interactive and community-driven than ever before. More jobs to do in your garden every week! We know readers are passionate, committed gardeners and we want to inspire them to get outside and get working! A new series helping to save the UK’s endangered plants – readers can now join in and become a Plant Hero! We’re working with the Plant Heritage Charity and want readers to get involved. Every week we will feature people already working to protect rare and endangered species. A showcase of the best new plants and products in the garden centre - something new and exciting every single week! Plus we’ll tell you what you should be planting right now, as well as a new eco-gardening feature, The Natural Gardener. The Kitchen Gardener - a new series by renowned gardener and former winner of TV’s Great Allotment Challenge Rob Smith, helping readers grow with him through the year. PLUS don’t forget FREE seeds every week! This Week’s Features: Clever ways with clematis, Invest in a cold frame and Grow some summer sunshine with gorgeous daisies. Carol Klein on the joy of native primroses. Our Garden of the Week is down by the riverside - the historic gardens surrounding an ancient Suffolk mill are being developed in harmony with the local wildlife. The Garden News Team are planting dahlias in pots, transplanting large evergreen shrubs and sowig herbs in pots. Garden News Expert Contributor: Dave Gillam is propagating dahlias, Alasdair Glen is looking out for spiky supermarket bargains, whilst Ken Abel is taking pelargonium cuttings.